Nature gives us wonderful decorations in each season! 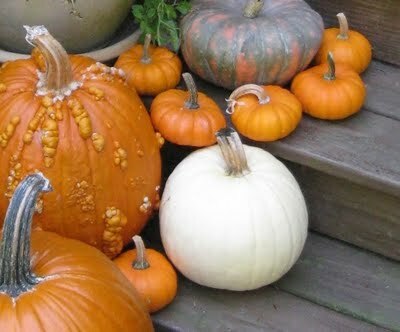 Autumn is ushered in with chrysanthemums and cornstalks but the ornaments are pumpkins and gourds. I love them in all their varieties. I especially like moonshine pumpkins. These white pumpkins are a perfect representation of the harvest moon. I look at them and my mind conjures up a witch with her black cat riding her broomstick across the moonlit Halloween sky while my children below scurry door-to-door in their scary trick-or-treat costumes. And after it is all over, the pumpkins are baked into delicious pies and breads for the Thanksgiving holiday. 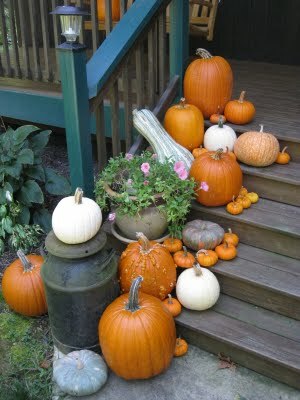 Pumpkins and gourds are a great addition to every garden. No, I did not grow all of these. They are courtesy of the University of Maryland variety trials at the Western Maryland Research and Education Center.